"The rains came down and the floods came up..."
We are safe and sound in Phnom Penh, though you wouldn't know it from my blog posts, which have been non-existent over the last few days. It's not that there's nothing to say, it's just that I've been going pretty much non-stop for 14 hours a day. Whereas it's usually just my family with me, this year I've also had staff from Asia's Hope in the U.S., a video team from Scarlet City Church and supporters from Columbus, Ohio to lead, guide and chauffer. It's been tiring, but also really exciting; I love introducing Asia's Hope and the countries in which we serve to "newbies." I helps keep my love for the people and places fresh. Yesterday was an especially exhausting one. We got up, packed 9 of us in the 15-passenger mini-bus I've been driving around Cambodia and picked up the Biehn family from their hotel a few blocks away. I should stop here and point out that, even in the best of traffic conditions, conveying such a vehicle around Phnom Penh is stressful. It's enormous. The steering is imprecise. The shifter feels like a plunger in a bowl full of rocks. And the other people on the road -- drivers, cyclist, kamikaze motorbikers, pedestrians, stray animals and food carts -- don't really care that you don't know exactly what you're doing or where you're going. They dart in and out on all sides, swarming like a school of fish in a reef. Yesterday, we didn't experience anything like "the best of traffic conditions." The neighborhood between our hotel and the Biehns' is apparently the site of some week-long royal birthday celebration, so most of the streets are closed, clogged with revelers or both. What should be an easy drive -- straight down this street, turn left on that one -- is always an adventure. But we made it. We picked the Biehn's up, and brought them to breakfast, after which they returned to their hotel on foot (rational choice on their part), my boys and one Scarlet City guy headed to the market via tuk-tuk, my wife and daughter returned to their hotel by some means unknown to me. I took the Scarlet City guys -- Danny and Janelle Jackson, Pastor Gabe DeGarneaux and his daughter Lilly -- to the Tuol Sleng Genocide Museum. 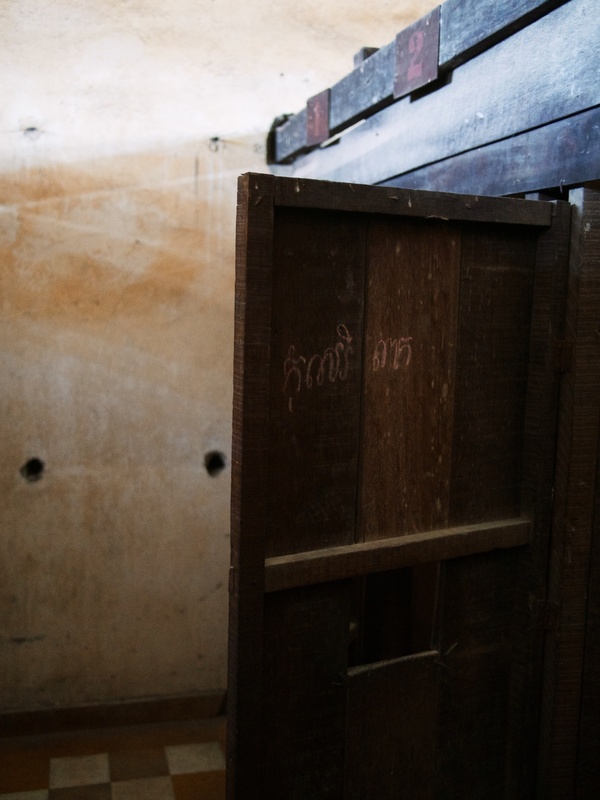 I've been to Tuol Sleng many times. I don't have the mental or emotional energy to process it again here on this blog, but it's a terrible place. 30 years ago, it was quite literally hell on earth: what the entire planet would look like if Satan was given free rein to twist the planet into his hateful image. 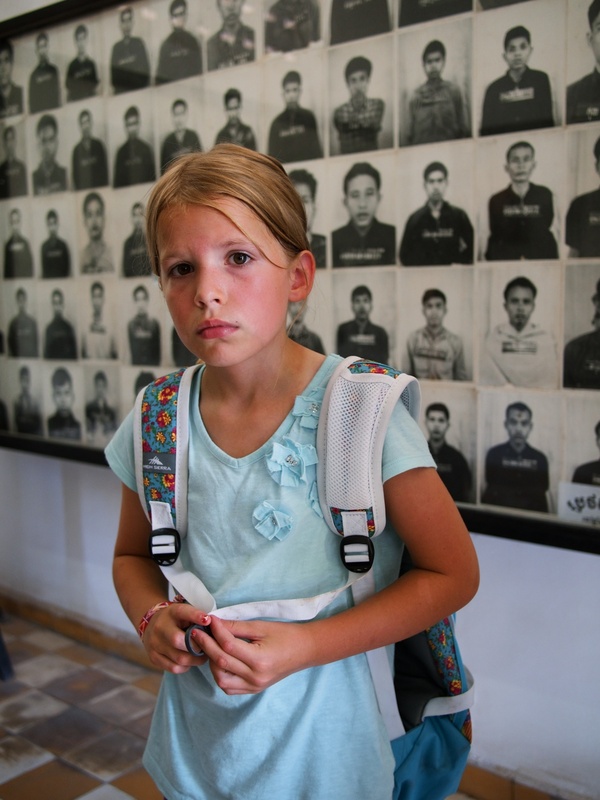 Torture, dismemberment, murder, lies, violence, injustice -- all at a level that, even after hearing the testimonies, looking at the photos and reading the stories, is unfathomable. I spent the morning trying to explain it all to 8-year-old Lilly. Explain it to an 8 year old? I can't even understand it myself. But I did my best. 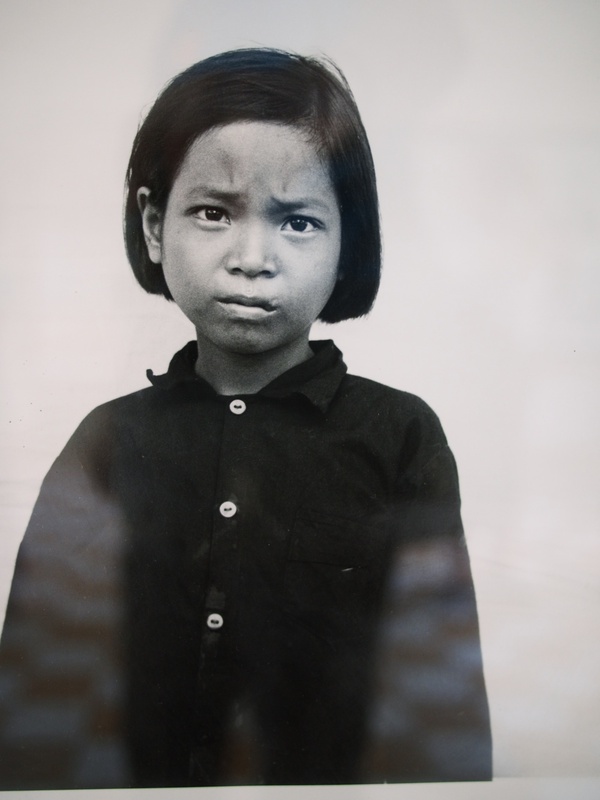 I talked about the American bombings that killed more than 100,000 Cambodian civilians, the U.S.-Soviet proxy war that used Southeast Asia as its gory chessboard and its government and peoples as its hapless, doomed pawns, the various internal power factions scrambling to take advantage of the chaos. And the evil. Behind it all was capital-E-Evil, Satan's greasy maw and bloody claws tearing, killing and consuming men women and children by the thousands. We saw the actual instruments of torture -- whips, knives, ropes, flails, shackles, bedframes, buckets, pliers, wires -- all used to beat, maim, rip, shock, crush, drown and hang. We saw the skulls, the bones, the teeth, the clothes the hair. We stared into the eyes of the victims, meticulously photogrpahed and matched to forced, false confessions before being murdered. 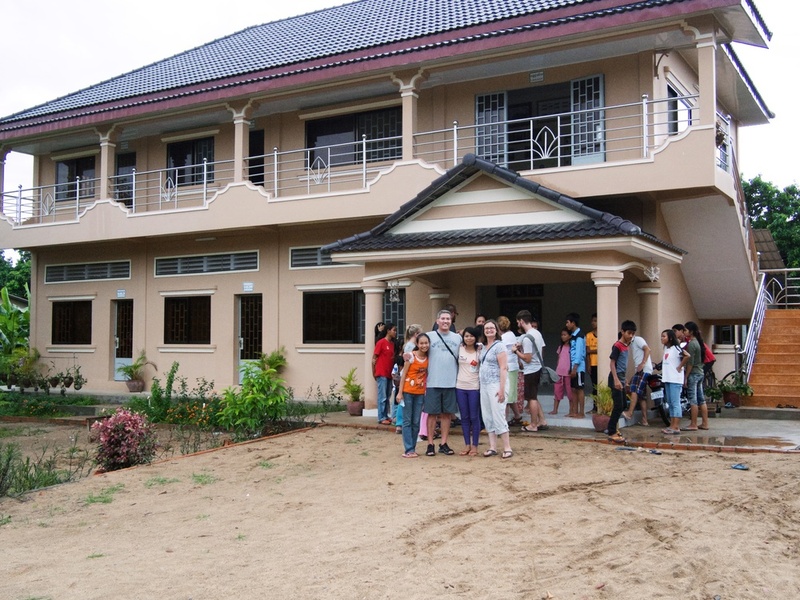 We grabbed a quick lunch at the cafe near our hotel, picked up the Biehn's and headed out of the city, over the Mekong to our beautiful new campus at Prek Eng. When we arrived, school was just letting out. 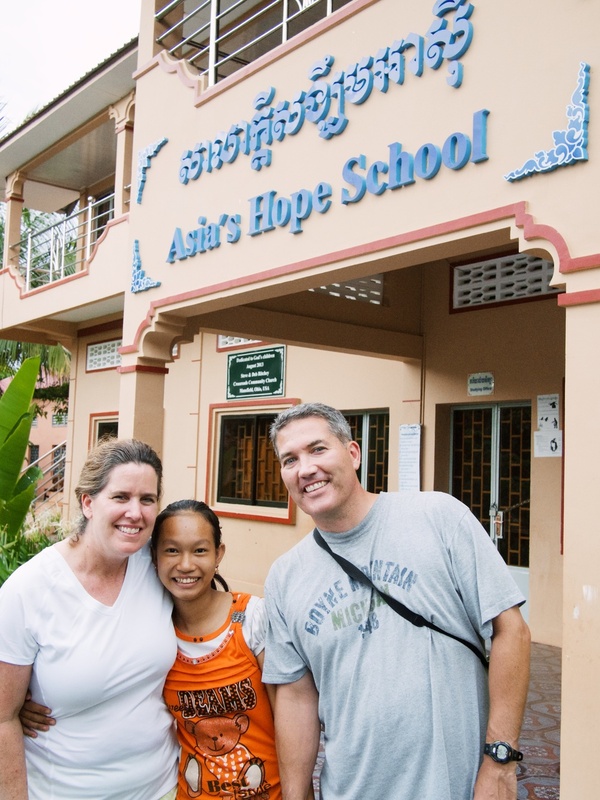 The Asia's Hope School hosts about 140 kids, Kindergarten through 6th grade. 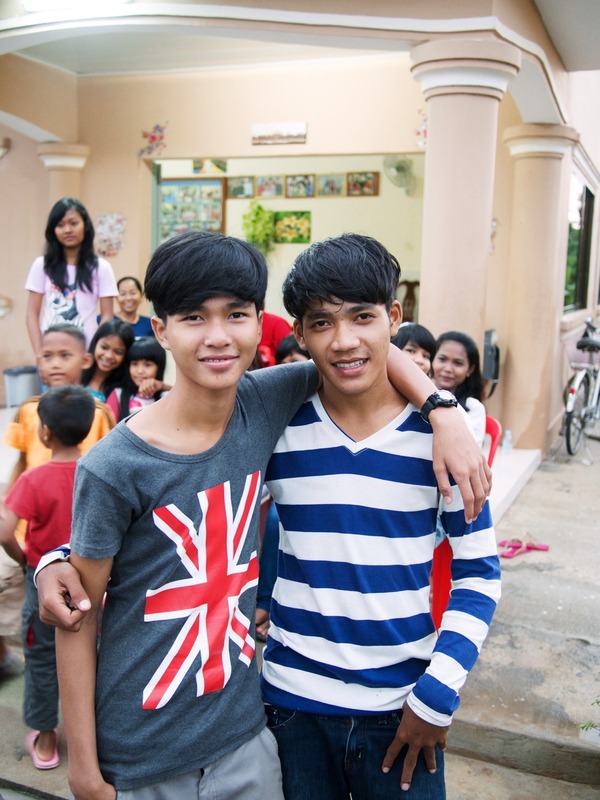 Because many of our kids now attend public middle and high schools, about 90 of the Asia's Hope School students are "community kids" from the surrounding area. 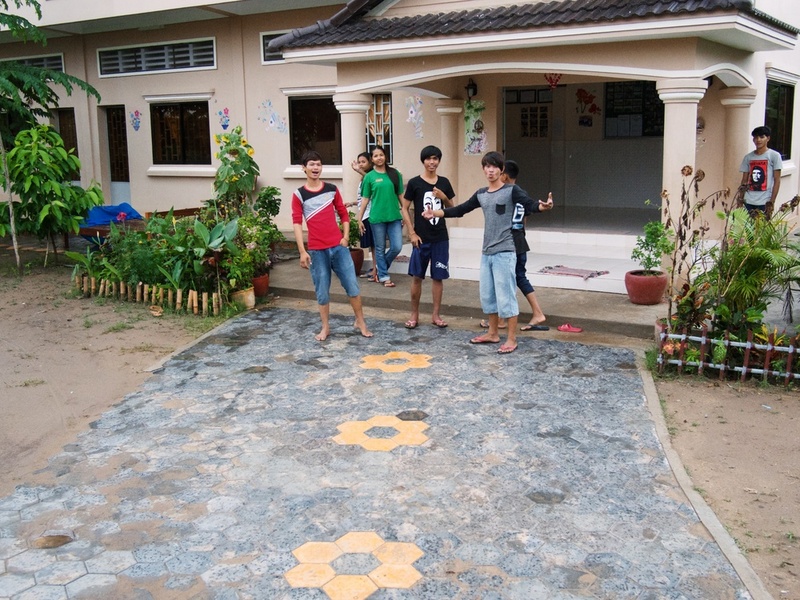 The rest are children who live at our five Prek Eng homes. Shortly after we arrived, the rain started, scuppering our video shoot agenda for the afternoon. It came down in sheets. In buckets. In torrents. It rained so hard that our homes' front yards became ponds, our sidewalks turned into rivers. I think we may have actually had white water rapids in our school parking lot for a few minutes. It was beautiful; the rain knocked about 20 degrees farenheit off the scorching afternoon heat. It was also loud. Our homes all have metal roofs, so for a while there, it was like being inside a Tom Grosset drum solo. When it was all over and the water receded, the kids ran outside and picked up the fish that had failed to retreat to the safety of the nearby lakes, and the rest of us continued playing with the kids, transitioning from inside to out as the water drained. At dusk, we piled into the van, exhausted, and headed back to the city. Once we got over the Mekong bridge, we saw that the city hadn't drained very well at all. Major intersections were flooded, and traffic was grinding itself into a maddening knot: thousands of vehicles honking, lurching, stopping and stalling at each crossroads, people driving on sidewalks, through yards, into around and over one another. What should have taken 10 minutes too more than two hours. When we finally got within walking distance of a restaurant, I gave up on driving entirely. Although it took me ten minutes to move 20 feet across two lanes of traffic (one 'official,' the other on the sidewalk), I forced my way onto the front lot of a store, gave the parking lot guard a handful of dollars, went to the counter, bought a moderately priced bottle of hooch that I didn't really want and asked the proprietress if I could park there for a couple of hours. She scowled at me. And then she smiled, shook her head in something like amusement and said, "okay." We fought our way across the road on foot and collapsed into a Chinese restaurant where we proceeded to order way too much food. After two hours of eating, laughing, talking and drinking tea, we saw that the traffic had subsided, and we made our way back to our respective hotels. This morning, we're taking it easy. For me that means that I actually get a shower, and don't have to meet anyone for any reason before 9:00am. We will probably take a walk this morning, maybe visit a couple of shops. After lunch, we're heading back out to the campus, hopefully to get some video interviews with Savorn, some of the kids and with me. Please pray for our productivity and health. So far, none of us has prolapsed a colon, and I haven't hit anyone with my ungainly land yacht. Despite the challenges, we're having a great time. I can't wait to share some of the video with you. If it captures even half of the goodness that is Asia's Hope, my job of funding this beast should become a whole lot easier. "It's why Asia's Hope MUST succeed."